When I read about Windows IoT my first question was "Can I debug it in the kernel mode?". It happened "yes I can". Officially there is no information about kernel debugging. But Windows IoT is a subset of Windows 10 so theoretically it looked as possible. I will elaborate on JTAG debugging later. Now let's talk about WinDBG options and it happened that Microsoft left the door open , the image of Windows IoT released in November 2014 for Intel Galileo 2 had kernel debugging enabled via serial port at a speed 115200 bps . This is a picture of a board with an attached serial-to-USB converter. Be cautious as Intel Galileo 2 uses an Arduino style pinout that differs from a standard FTDI adapters. 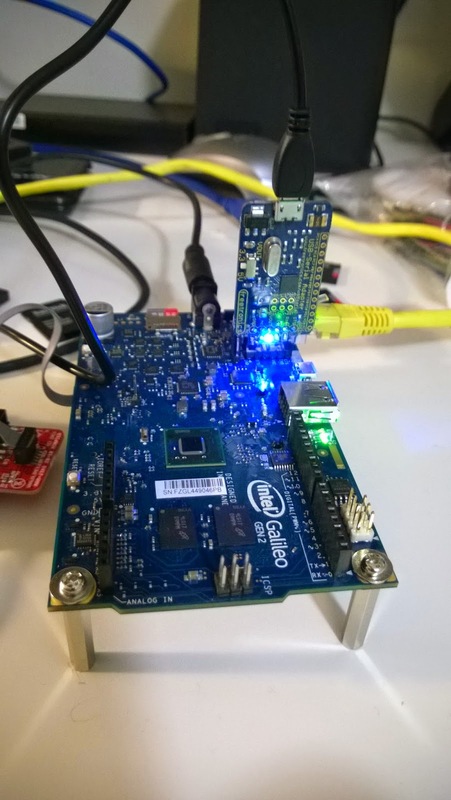 Also, Intel Galileo 2 uses 3.3v TTL logic for serial port communication, while some FTDI adapters have 5v TTL logic, do not confuse it with 5v VOUT which is not connected to anything on Intel Galileo 2 . 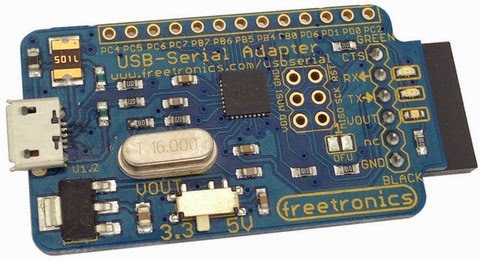 I use a USB Serial Adapter from Freetronics, which has 3.3-5v switch and Arduino pinout. After setting everything WinDBG shows a familiar output and you can break into the kernel, though there are no symbol files on the Microsoft symbol files server as Microsoft did not suppose that anybody outside MS would perform kernel mode debugging for Windows IoT.